Pundit Garth Crooks believes Manchester United defender Eric Bailly has ‘buckled’ under the expectation of representing the Red Devils at Old Trafford. The Ivory Coast international looked an exciting young talent when he first joined United from Villarreal in 2016, becoming Jose Mourinho’s first signing for the club. Initially looking like an ideal Mourinho player with his no-nonsense approach to defending and great show of passion on the pitch, things have recently turned sour for Bailly. The 24-year-old has fallen down the pecking order this season, having recently been subbed off in the first half of the game against Newcastle, and then failing to make the squad altogether for the Everton game this weekend. 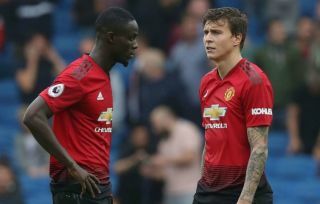 In his place, Victor Lindelof has started to settle and look more impressive in the first-team, and Crooks has praised him in his BBC Sport column this week. The Swede made Crooks’ team of the week, but the outspoken pundit was heavily critical of Bailly by suggesting he’s ‘buckled’ under the weight of expectation that comes from playing for such a big club. ‘I have watched this lad (Lindelof) perform for Manchester United with my head in my hands in utter despair at times. But not any more,’ Crooks said. It is worrying quite how quickly Bailly has seemed to go downhill at United, and some fans will no doubt continue to question if it’s simply the harsh approach of manager Jose Mourinho affecting a player’s confidence once again, as it has previously done with the likes of Luke Shaw and Anthony Martial, though they have recently improved.